Whether you daydream of al fresco dining, sunny breakfasts, breezy luncheons, romantic, moonlit gourmet dinners, or formal gala-style meals, from the bridge deck to the main dining salon, Bacchus provides the perfect settings to enjoy the chef’s delicious creations, the yacht’s stellar wine offerings, and the beautiful scenery. 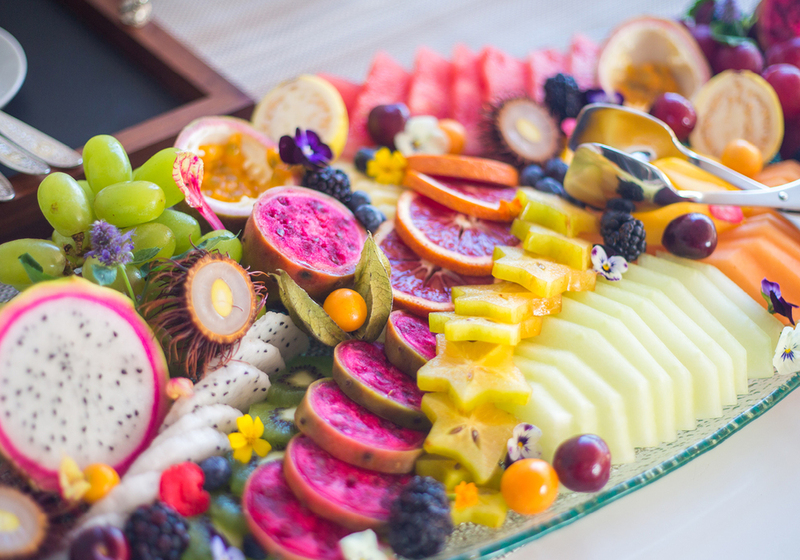 Your world-class culinary trained chef will prepare gourmet meals that will delight every guest while being tailored to every dietary preference, from light-and-healthy, to multi-course and divine. 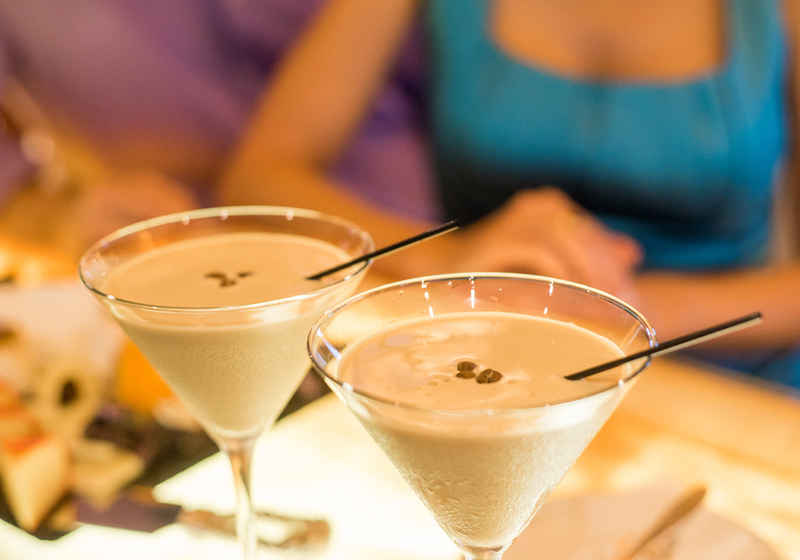 Each dining experience aboard Bacchus is exceptional. Formal dinners are held in the main dining area, at a large table highlighted by custom padded leather wall panels. Guests can select from custom wine list books detailing the yacht’s extensive onboard wine collection while the professional chef prepares multi-course gourmet dinners guaranteed to delight each palate and satisfy every dietary preference. The essence of the God of Wine comes to life in the skylounge, where a stunning bar, games table and intimate seating areas invite conversation, laughter and entertainment. The skylounge is a favorite reunion spot where charter guests enjoy cocktails on the backlit onyx top while others admire the custom 150-bottle wine display case. Guests and oenophiles alike will appreciate the skylounge aboard Bacchus. Featuring a custom 150-bottle wine display case and a corner bar with backlit onyx top, the skylounge is a preferred gathering spot, where guests may reminisce over an evening cocktail or after-dinner digestif. The bar and wine case display the carefully curated wine and liquor selections while a state-of-the-art entertainment system provides movies and music. An eight-person spa pool with built-in settees offers panoramic views from the spacious sundeck, while teak chaise lounge chairs provide sunbathing and relaxation comfort. 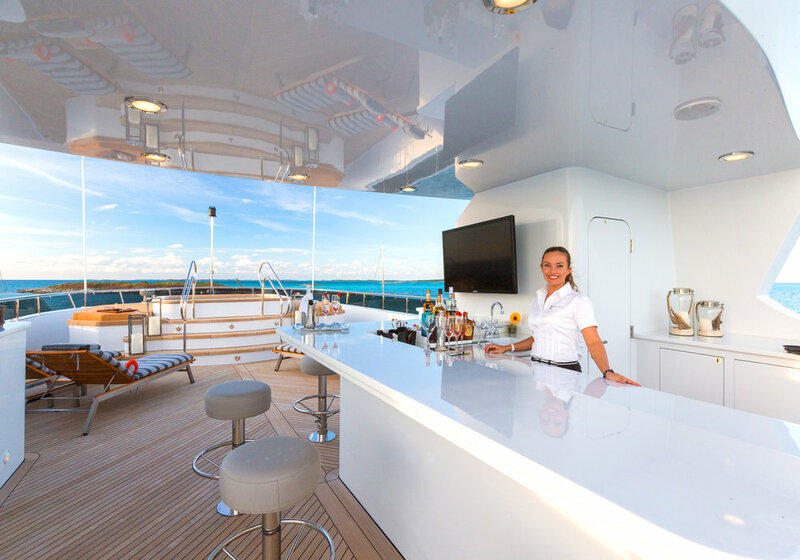 The sun deck’s forward section features a full bar and dayhead while the aft section transforms to a spacious entertainment area where guests can dance under the stars to steel drum beats. 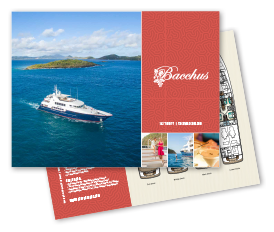 With plenty of water toys and activities to maximize each day, Bacchus promises the ultimate charter experience. Your professional crew will facilitate every activity and may even surprise you with theme night celebrations or a beautiful sunset beach picnic. After the sun has set, curl up in a luxurious throw blanket with a good book and a glass of fine wine and let the world slip away.